Fox Pest Control is the #1 Rochester pest control & extermination company. We have over 22 years experience, and have helped over 40,000 homeowners and businesses with carpenter bee extermination and other pest control. Read on to learn why we are the top choice for pest control in Rochester, then pick up the phone and call us for same day help with your pest problems. Carpenter bees seek out dry wood to live in. The wood of house siding, door trim, and window sills are good homes, as well as many other worn or unpainted wooden surfaces. Rochester carpenter bees set their sights high, so if you live near or own a home that has multiple stories, carpenter bees will most likely burrow on the second floor - for their own safety. Carpenter bee activity tends to be a nuisance and a threat to your Rochester residence. Too many carpenter bees burrowing at once can cause costly structural and aesthetic damage to the side of your home. Woodpeckers will often peck into house siding seeking carpenter bee larvae for food. While they do not sting, male carpenter bees are territorial. 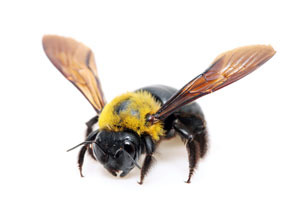 Female carpenter bees can sting if provoked which can be a danger to your family and pets. Call us today for Rochester carpenter bee control, so you and your family can rest assured your Rochester home will be safe.